You get all sorts of people sitting behind the indie and small press tables at comic cons. You get the ones who are coming to their first ever convention, nervous, sweaty and terrified. You get the old hands who instantly do what they do, relax, recline and chat to the fans in a cool and relaxed manner. You get the entrepreneurs who bring comics but also bring cards, prints and toys to try and break even. But sometimes, every so often, someone catches your eye. Someone who you can look in their eye and know instantly that they are proud of the bit of art in front of you. Kate Ashwin might have given me a sales pitch, but I wasn’t listening. 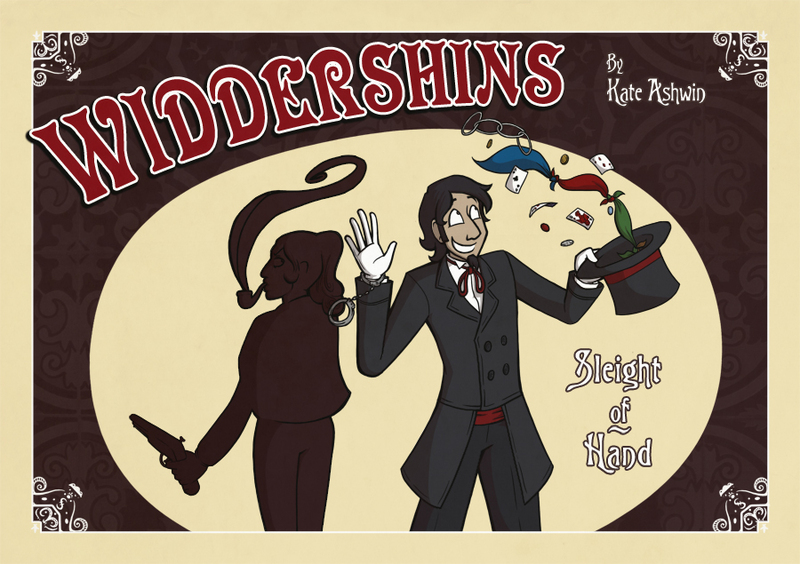 I took my hard earned ten pound note and bought a copy of Widdershins: Sleight of Hand purely for all the things she didn’t say. I wasn’t wrong to do so. The characters are unique and yet familiar. Sidney is a tall, dark stranger, the sort many romantic novels would lavishly describe as the charismatic silent type. Kate doesn’t describe him as this. He’s a Magician for one thing (the dodgy chin beard being a big clue) who has led a sheltered life and relishes the terrifying notion of being held at gun point with a child like enthusiasm. Not your conventional tall, dark stranger, but character work is where Kate excels. That said, I can’t wait to tell you about Harry. 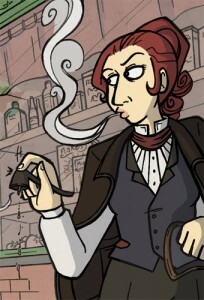 Pipe smoking, pistol wielding cool customer, Harry is the red headed heroine of the piece. I love Harry. This is very rare for me as I find characters who are “cool” quite repellent, but Harry is so unique and so well crafted, it’s easy to be charmed by her and her nicotine addiction. 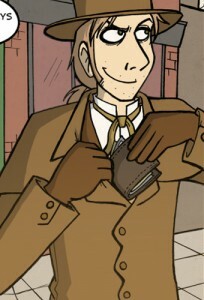 In a world where magic exists, Sidney magically and completely accidently manages to obtain a rather curious bracelet. So rare and sought after, this bracelet instantly turns the owner into the “Thiefking” and can only be removed from the owner’s wrist upon their death. Since the previous Thiefking is still alive, Sidney is now in a lot of danger as he and Harry try and figure out how to get rid of the blasted thing. What Kate does is take a rather complicated story and makes it work. Drawn by the charm and uniqueness of the characters and the prospect of going on a wild adventure, this is a lovable small press comics. The art has an animated look about it which works to show the vast array of expression of the characters. The colour shceme has a lot of browns and dark yellows that really emphasis the Victorian period of this story. The background art does what good background art should do in a book focused on characters. It’s unnoticeable. Thankfully, being an artist who has slaved on backgrounds designed to be unnoticed, I noticed them. Tiny details like the melted candles, propaganda posters and the odd basket of flowers hanging from a street lamp add to the atmosphere of every panel. As far as I’m aware, this is Kate’s first book and if this IS her first book, then this is the sort of young talent that makes the British Small Press Comics Industry worth investing in. Make sure you remember the name Kate Ashwin in the future and if you pick up that book and love the characters as much as I did, be glad that I trusted that look of pride in Kate’s eyes.